His nose lifts, sniffing once. Twice. He neighs, then glances over his shoulder. Daring me to respond. He paws the ground, I tap his shoulder, matching his rhythm. We walk, trot, and canter under saddle. We walk to cool down. He snorts and blows and shakes his head. “Good Boy,” I say, petting his shoulder fondly. Soon, his mom will get him and bring him home and I’ll never see him again. A baby sits at a table. She reaches toward a crayon, grasping it in her chubby fist. “Color on the paper, honey,” Mom says. The child grows into a toddler. She reaches toward a crayon. The child grows, now able to hold the crayon properly. “Make sure that when you color, use the proper crayon. What color is the sky?” Mom asks. Cappy has worked inside up until now. He’s learned his gaits and he’s almost ready. Soon we’ll ride outside. I’ve guided him step by step, trying to fill holes in his education gradually and without reprimand–only reward. I’ve started with a base layer of color and I’m adding to the masterpiece. I want to be certain if he reacts outside, it isn’t from fear/uncertainty/confusion about my instructions, which would only leave environmental concerns. 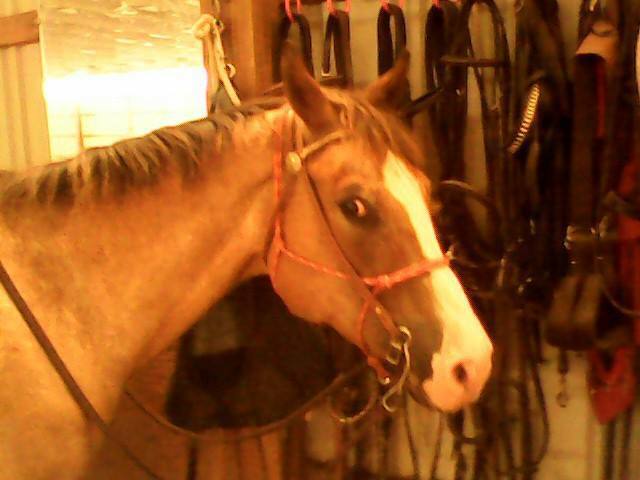 If he’s upset over a tree, or a car, or another animal, I can deal with them once he’s obedient under saddle. The baby boy is almost what I’d consider green broke. Once he’s ready, he’ll go home. Until then, he’s my canvas to play on. She lifted a foot into the stirrup and adjusted her body to spring up. She jumped and landed lightly in the saddle, shifting her weight. The horse, irritated to feel this sudden burden, arched his back and bucked. The rider clasped her legs around his sides, holding close to his writhing, jumping body. The horse bucked and bucked until his rider couldn’t take a moment more. She let go of the horse, and then splattered against the side of the arena wall, her body spraying blood in every direction. The horse proceeded to buck on her gory remains, at one point reaching down and ripping her body to shreds as if he were a lion–and she, a wildebeest. I imagined Cappy’s first ride each time I played with him. I hoped for calm, collected intelligence from this delightful horse. Unfortunately, no matter how well I prepare, that’s not always what I receive when I train a horse to be ridden. Instead, though I hoped and prayed for a cool, calm, collected horse, I planned for an insane crazy horse. Some horses, no matter how much you prepare them, will not get past the idea that sitting on them is a bad idea. They want you on the ground. Cappy and I played from the ground constantly. I drove him. I leaned on his back. I jumped next to him on the pedestal. Today, I rode him for the first time. Trudie, a very trusted Minion, held him for me while I repetedly mounted and dismounted. I petted him and called him a good boy. He thrived on the attention. Then, one time after I mounted, I told Trudie to walk forward. That’s when fireworks should have started. But not for Cappy. He walked around like he owned the place. Trudie stopped to praise him, and he wanted to keep walking. No bucks. No crow hopping. Not a blink of an eye, a shiver, or a wince. I rode Cappy for the first time today. Soft whiskers probe my hands. His breath whuffs across my arm, and I shiver. He nudges my knee, and lowers his head. I pull the treat from my pocket, and soft lips close over it. He licks his lips and sighs. Cappy and I have an understanding. We argue; we cooperate; but in the end, I’m in charge. Firefly Farm is a hub of activity in the summer. Honey left us yesterday to spend time at Autumn Breeze Acres, where she’ll be bred to Amber Williams’ horse Rolex. He’s the stud I intended for Melody (after Awemost Dun died.) Apparently Honey is acting her usual gentle, sweet self. Suzi Q. attended two shows this spring and brought home an extensive array of ribbons–and a trophy. 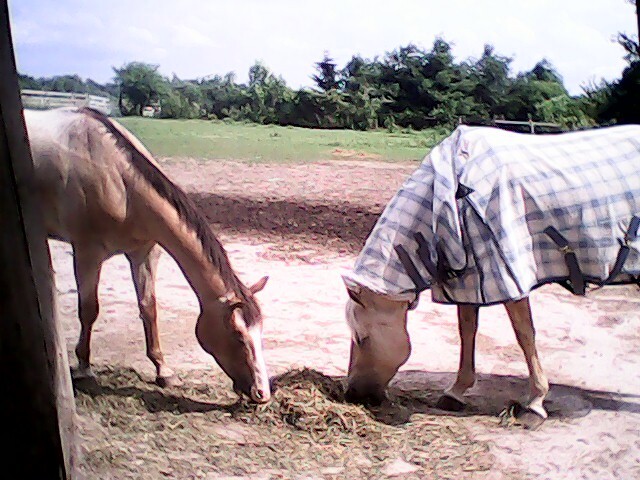 I expanded the mare and gelding pastures, planted a weeping willow tree, and have mowed down weeds in the pasture as they crop up. Today is Cappy’s day. His coppery chestnut coat gleams. (On a related note, my arms are sore.) He willingly stands on the pedestal, and as of this morning, will do so with a tarp over his body. He lunges–walk, trot, and canter–to the left, and walks on the lunge line to the right. He accepts the bridle and bit. I can lay across his back facing both directions and he stands still. I can use direct reining to make him change direction. Cappy is brilliant. He’s fun to work with. In 11 months, Honey will bring a new project into the world. Someone I can take to shows who will earn ribbons. Someone who will stand in the shade of my weeping willow tree and swish his or her tail. I’ll brush my foal until my arms look like that of a bodybuilder.